Steve is an AMGA trained guide and has been guiding for Uprising since 2011. 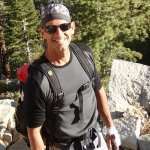 He is not only a Joshua Tree local, but started his climbing career in 1989 in what was known as his “backyard”, Joshua Tree National Monument. While climbing with people who are now the pioneers of rock climbing history, Steve was on the cutting edge of establishing routes in the Park by leading and supporting leaders of the first ascents of routes that live on in our guide books. Being from the desert he also established routes in obscure and steep granite hideaways such as Giant Rock’s DMZ area. Its not just the desert where Steve has climbed though. He takes his love of climbing to places throughout the USA and Europe. Spain’s Catalonia, Big Bear, Idyllwild, Yosemite Valley, Toulumne, The Needles, Jackson Hole, Devil’s Tower, Black Canyon of the Gunnison and many more. Steve has spent his career as a concrete and general contractor and brings his attention to detail to climbing with his strength, character and technical expertise. He will not only teach you safety and technique, but ways in which you can improve your abilities to move you to the next level of climbing. And his energy, witty humor and true love of the sport, Steve will inspire you to be your best.